Still reading? OK then. This post will seek to briefly answer the question of how to use a Filofax. It will not address the issue of why to use a Filofax, nor whether to use a Filofax. I’m assuming you have worked through these questions yourself. So, how should you use it? The real – but potentially unhelpful – answer is, ‘However you like.’ What follows is just one possible answer; it is based on my experience of what works (for me) and what doesn’t (again, for me), filtered through the sieve of my own likes and annoyances. I’ll try to keep it snappy; we’re all busy people. 1. Put all other notebooks, planners and pads out of reach. While you are getting your Filofax up and running (say, the first couple of weeks you spend using it) you don’t want the distraction of handling multiple systems. 2. Write in your diary every appointment you need to remember, including other people’s insofar as they affect you. For instance, is your partner going out for the evening one day next week? That needs to be in your diary too if it means you will have to be at home providing childcare. 3. Every day, read today’s diary and scan about a week ahead. Look for events that have been cancelled or are no longer relevant. Delete them. Think about any events you might need to add. Add them. 4. Maintain a separate (i.e. 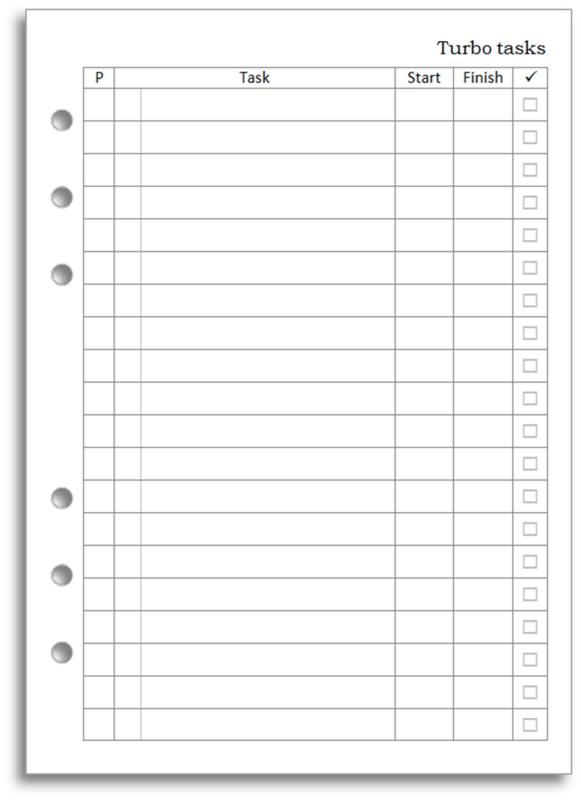 separate from the diary) list if you want to use your Filofax to manage tasks. 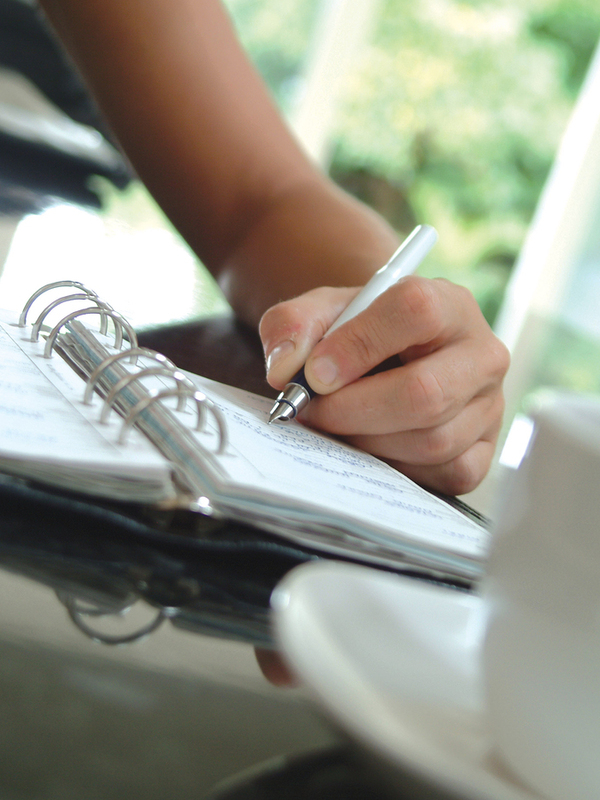 The only time a task should be in your diary is if it needs to be done on a particular day. If it is just a matter of having to be done by a particular day, it belongs not in the diary but in the task list, where you should also note the deadline date. You can do this with standard Filofax task pages, but it’s easier with Turbo Task pages. 7. 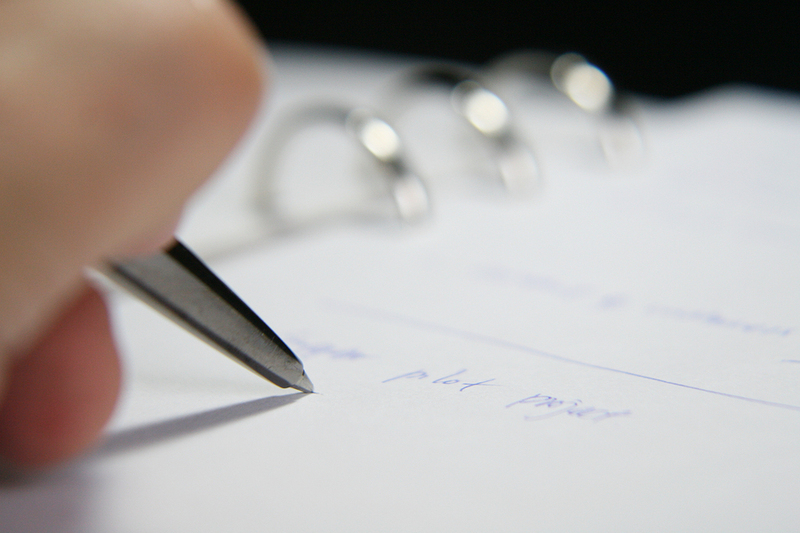 Whenever you set or accept an appointment or identify a task, write it down in the appropriate section straight away. Don’t try to remember it to write in later. Don’t write it on a scrap of paper to transfer later. Write it in the correct place in your Filofax right now. No excuses. 8. 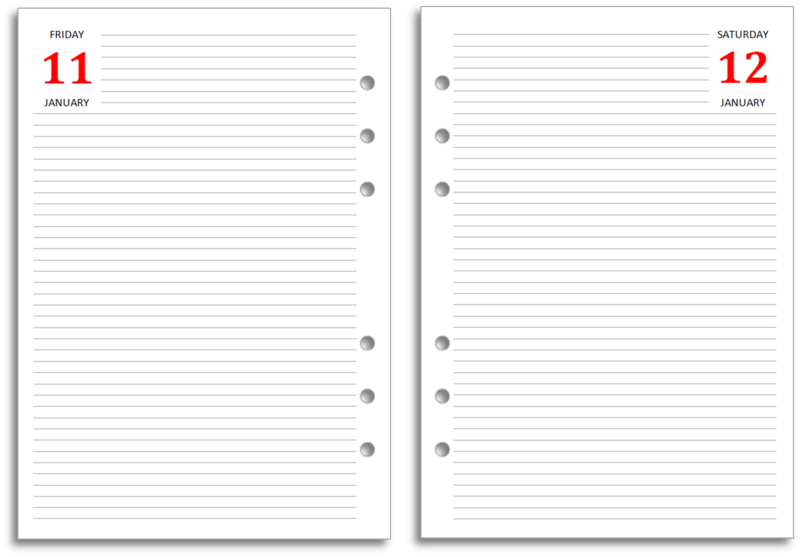 Have a notes section with plenty of blank paper. Write down anything you need to remember that isn’t a diary or task entry. You can use plain paper or lined, grid, dot grid or a selection. The paper can be different colours if you like. If you must, you can decorate it. 11. 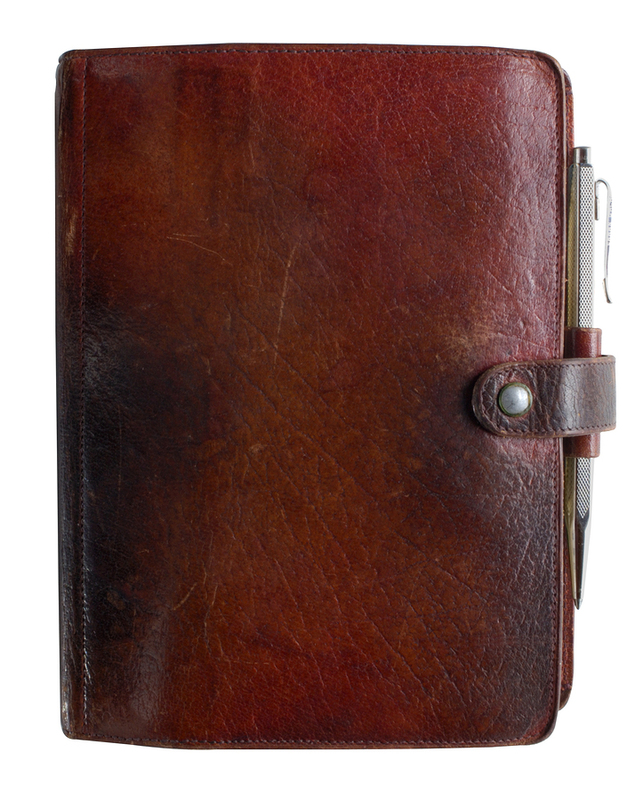 These three sections – diary, tasks and notes – are the heart of your Filofax. If you want you can have other sections too, say for addresses, to track your finances or to hold long term reference information. 12. Do not stuff your Filofax with pages or accessories you will not use every day. Your system has rings. You can add things and remove them whenever you like. Have a photo or two in there if you like, by all means, but it is a personal organiser, not a scrapbook. Anything that doesn’t help organise you should not be in it. 13. Use dividers to help you get to different sections quickly. Use sticky tabs to categorise sub-sections. This might be useful if you decide to keep multiple lask lists (e.g. home and office.) Have some sort of ‘today’ marker in your diary. 14. Keep a pen or pencil in the pen loop. Choose one that fits the loop and that will not fall out. Don’t feel that you need to use that particular instrument every time you write in your Filofax. If you carry a pen or two in your pocket or bag, use those. But keeping one pen/pencil in the loop means you will never be caught without something to write with. It’s a fallback. 15. Keep doing all the above. Don’t lapse. Keep forcing yourself until it becomes habitual. Again, no excuses. You can, of course, download and print most of the pages you’ll need from my site. Diary inserts are here. Other inserts are here. They are free to download and free for your personal use. So there it is. That is how to use a Filofax. Unless you want to use it differently. It’s up to you. You can do what you want; I’m not your mother. Ray Blake makes his home on the Internet at My Life All In One Place, where he offers a metric ton of planner advice and free printable inserts for both ringed planners and traveler’s notebook style planners. He best describes his planner usage in his own words here. I enjoyed your article. It is well written and concise. Rule #12 is my favorite, especially the statement that your working in a personal organizer and not a scrapbook. That really hit home for me to keep the bulk out of my planner. As always brilliantly helpful and concise Ray.. Thanks again for gelping us focus on what’s important and get back to track.